Personal development has been an enormously popular topic, from Dale Carnegie's How to Win Friends and Influence People to Gretchen Rubin's The Happiness Project, from Tony Robbins to Deepak Chopra. But it's not working anymore. Many of us struggle with the same, on-going battles day in and day out. We attract a new mate but have the same old fights. We increase our pay check but end up broke. We fight for our health only to slip back into the same, old habits. And the harder we try to change, the more difficult it becomes. Emergence is not the end of the old you, it is the beginning of the real you. In seven stages, spiritual life coach Derek Rydall shows you how to unlock your truest self by realizing that the self is already whole and everything we need for fulfilment is already in us. Bringing this idea together with his proven, simple, practical techniques, Rydall already has reached tens of thousands of people around the country with his unique, eye-opening, and life-changing message. You can be next. 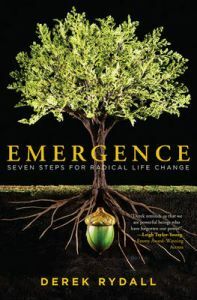 Backed by ancient truths that have been largely lost throughout history, Emergence enlivens the conversation about how to achieve your physical, mental, and spiritual potential. Empower your purpose in life and activate the genius within-the Emergence Movement is waiting in you. Derek Rydall is a prominent life coach and active speaker, bringing his unique brand of inspiration to audiences around the country. He writes for the Huffington Post and Spirituality & Health, among others.